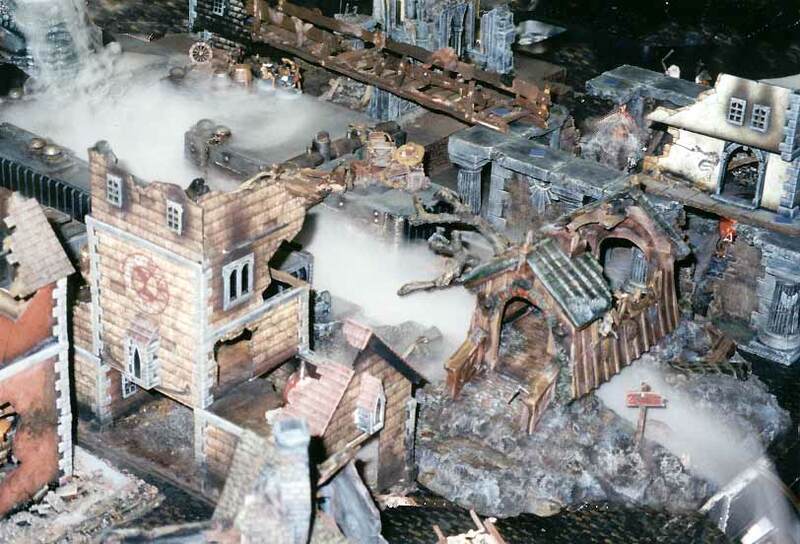 I always wanted to use dry ice in a Mordheim game (I even wrote a special scenario for it based on the John Carpenter movie, "The Fog"). When I heard you could buy electric devices that generated the same effect, I had to get one. Because the device uses a lot of water (and is pretty splashy), I had to make a piece of terrain that would contain the splash but allow the fog to escape. 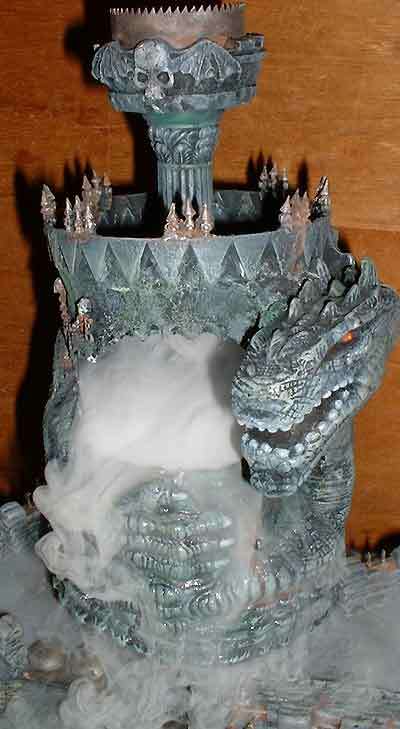 Turns out I had an old piece of terrain I started but never finished that was just right- an old Godzilla Cup Holder (from Taco Bell) I had converted into a tower. Because I used a large plastic cup for the interior, it was perfect for holding water. Since I had superglued a plastic flower pot tray on top to form the tower, it kept the splashing contained too! All I had to do was cut a large hole in the front (for the fog to escape) and a small one in back (for the wire to come out). After installing the vapor device, I taped up the hole in back to minimize leaking. To finish the piece, I added a wedding cake column to the tower top, and capped it off with a candle holder that had a winged skull detail on it (bought around Halloween of course). 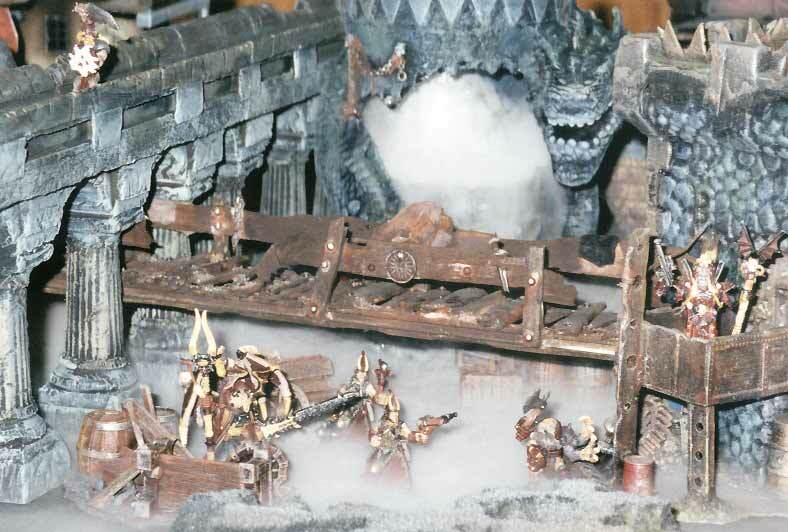 The spaced spikes are from the old ork Battlewagon track sprue, and some chaos rhino chains also embellish the tower. This thing puts out a decent amount of fog, so I need to refill it about every half an hour. As the fog rolls out, it condenses on anything it touches, so everything under it gets pretty wet! Fortunately, most of my terrain is made of plastic and painted with enamels- otherwise, the water could easily damage cardboard and water base paint. 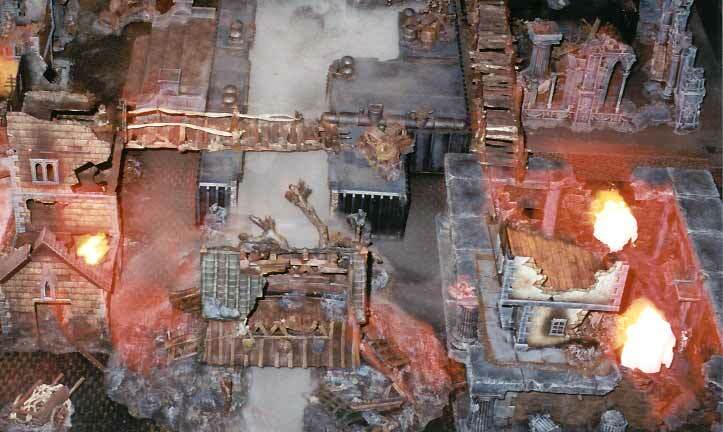 The shot above includes the tower, some of my newly created Aqueduct terrain, some catwalks and barricades, and a nasty warband of Posessed models roaming through the fog. HERE'S ANOTHER SHOT OF FOG IN ACTION (use your back key to return here). In the shot above, I have placed my fog machine at the head of the Docks terrain, which then leads into my new Bridge piece (made from a Porcelain Christmas decoration and a base built up with pressboard, rocks, and concrete patch). The fog went so far, it is actually spilling off the table edge in the lower right corner of the pic! By the way, for those who are curious, the device I bought is called a Mini Nebler (made in Germany). Here's a pic of the device, and the box it comes in. You may be able to find them in Party Supply, Garden Supply, or Discovery stores. The original intent was to use it in a fountain. AND NOW, ON WITH THE SNOW!